quarrygirl.com » Blog Archive » vegan taco tuesday in highland park! vegan taco tuesday in highland park! vegan taco tuesday is coming to highland park this week! 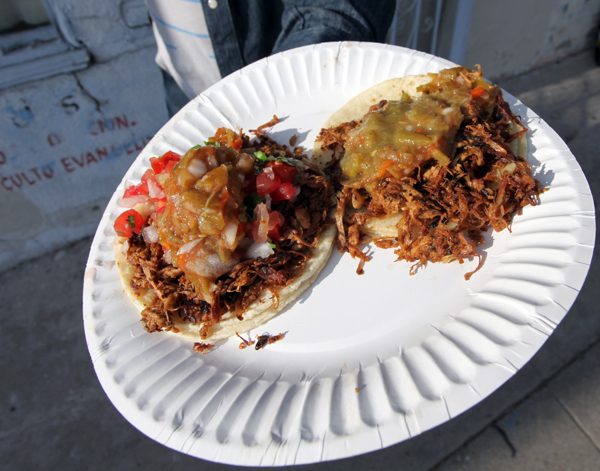 join us for a night of drinking booze and eating jackfruit carnitas from our favorite soon-to-be vegan drive thru restaurant, plant food for people, at johnny’s bar on york blvd. we absolutely love the plant food for people tacos, and they aren’t available very often, so be sure to check them out on tuesday if you have a chance. Tell me they’ll be outside so those of us under 21 can still have some tacos?? i’m sure you can convince someone to smuggle some tacos out to the sidewalk for you. kinda surprised they’re cooking inside the bar, though? johnny’s doesn’t have a kitchen, last time i checked. hell, i don’t think their sinks even work. I stopped by last night and the tacos were delicious! The “meat” and the different sauces “estuvieron deliciosos”!!! Thanks again Janese for the amazing food! i stopped by late last night and got a taco, too. was delicious as always. i wish i could get them every day. let’s get these guys a permanent kitchen soon! Loved the tomatillo salsa and the spicy vegan mayo!